As you know, I rarely, if ever, go off topic on this blog. This is especially true when it comes to "real" issues like politics, religion, American Idol, etc. But, this week's controversy regarding Rachael Ray and her "terrorist" scarf has sent me over the edge. Chances are you've already seen this all over the news, but if not, the clip below will give you the gist of it (chosen from FOX News so you know it will be objective!). I've stated before on this blog, I'm not a huge fan of her shows, but I am a staunch Rachael Ray supporter. Regardless of what you think of her bubbly personality, or easy-to-mock delivery, she is inspiring lots of people to cook at home, which is all that matters in my book. Regarding this amazingly ridiculous scarf issue; anyone that seriously thinks her scarf was some sort of subtle symbol of support for Islamic terrorists, and that the ad must be pulled to avoid "sending the wrong message," is a complete moron. Even worse than these sad, paranoid, misguided, faux-patriots who sent out emails calling for a boycott, are the brain-dead idiots that actually followed their instructions. Talk about being dumber than a doughnut. Consider the source - it is after all The Fox, and just as in the tale of Red Riding Hood, this is the news not to trust. Lose that number on your channel selector! I heard about this on another blog - so ridiculous. Michelle Malkin, the woman who started the whole thing, is one of the MOST ignorant women I have ever seen. This is far from her only stupid idea. I hope the scary lady in glasses doesn't come to Europe, because she would have a heart attack. In here, a lot of people wear those becasue they like them and end of the story. She would think half France, Belgium and Spain are terrorist and bombs us all. Some people on the Left were actually wearing these scarves to make subtle show of support for the plight of Palestine, and it became chic - it was not blatant like a T-shirt with Che Guevarra on it but it was made to make a statement. I remember when I was in school about 10 years ago, a good friend of mine was fond of wearing it - and for a moment it made me wonder about what his politics were. wow that is seriously the most absurd thing i've ever seen. i know now why i dont watch tv. its like they're trying to pull stories out of their asses. I read this post, was duly irritated by people and filed the information in my mental file cabinet. Then I heard a news story all about it on NPR. You truly have your finger on the pulse of society, sir! As an arab, I can honestly say that the kefiya is something millions of arab men throughout the middle east wear every day. I don't see what the big deal is if Rachael Ray wears it! And I don't think it symbolises anything apart from something to protect your head from the sun, and wrap around your face in the dust. Your points are well taken and applauded. To quote Sigmund Freud "sometimes a cigar is just a cigar." Outrageous! People in this country need to learn where the medium is. Either we swing one way and are "politically correct" about way too much, or we swing the other way and 'get offended' from silly things such as scarves that are reminiscent of muslims' clothing. I think it would be obvious if Rachael Ray was a terrorist supporter. Now, I'm not muslim, middle-eastern, nor do I speak arabic - but might I remind everyone also that not all muslims, people of middle eastern countries, or arabic-speaking people are terrorists! Get over it people and stop making big stinks out of such silly things, we have so many other things that are more worthy of our energy and media-coverage. I just wanted to check in and say I really enjoy your blog. Hmmm - Does Lenore Schenazy ryhme with CRAZY? And what's that scarf around her neck? Looks a little terrorist-ish to me. It's funny that this is connected to Dunkin Donuts. People think that DD is a good American company. It's not- it is owned by Allied Domecq which is a European company which is owned by WHO? There are many European Companies that are owned by the Arabs. They love to send messages. Sometimes a cigar is not a cigar. Allied Domecq doesn't own DD. Not that it would matter either way. Like I said, if you think who ever dressed RR was trying to make a pro terrorist, or any other statement, you are a moron. 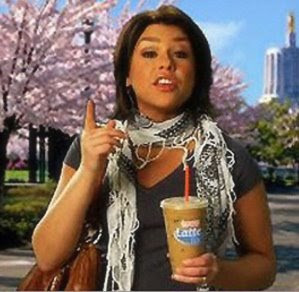 I don't believe Rachael and Dunkin Donuts were trying to perpetuate any terrorist agenda or express sympathies with jihadists. No, the terrorism comes in the form of the Rachael Ray Show, a daily 60-minute drivel fest that is so torturous to watch it makes waterboarding seem like boogie boarding. The scarf isn't the problem. It's her recipes with names like "POP-sta Pasta Bar with Three Sauces" and "Jambasta". The scarf looks nothing like the head wrap. Who cares! Michelle Malkin is the daughter of immigrants from the Philippines. Yet she spews the most vial, demented, hate mongering vitriol against immigrants. Its pathetic. In her latest book she thought that the US policy during WWII of interning Japanese Americans was a great idea. that's U.S Citizens born to Japanese parents mind you and interning is a polite way of saying "shipped to concentration camps"
The fact that DD caved in to the demands of such a loon is really really sad and shows how much trouble this country is in at the moment. People are just too worried about supporting the so called 'terrorists' that they freak out on anyone that has any similarity to them, that or else there really isn't much to report other then the economy tanking.